The second groups of tailors to be covered in this series about prominent HK tailors are the British and the Indians. In the Seaports of the Far East from 1907, Harry Eyre, who had trained at the famous London drapery Peter Robinson’s on Oxford Street, was listed as manager of William Powell and the firm had 17 European staff and 30 Chinese staff. The chairman was Geoffrey Charles (G.C.) Moxon, a famous stockbroker. In the 1920s, William Powell appeared to be absorbed by Lane Crawford and the chairman of the firm was James Harper (J.H.) Taggart (manager of the HK & Shanghai Hotels) and directors included M. Manuk (head of Dairy Farm), R.L. Bridger (Lane Crawford) and managing directors Frank M. Crawford (son of Lane Crawford founder Ninian Crawford) and H.O. Holt. By the 1930s, the chairman of the firm was Edward Maurice (E.M.) Raymond (1886-1948), a prominent Jewish stockbroker who was also trustee of the Ohel Leah Synagogue and commissioner of the St John’s Ambulance Brigade (1939-47) and the managing director of the firm was Hubert Overy (1885-1945). Both of them were interned in Stanley during the War and Overy sadly died in the camp on August 26, 1945, 4 days before the British fleet arrived. After the War, the board of the company was comprised of chairman Frederick Charles (F.C.) Barry (1899-1952, managing director of HK & Shanghai Hotels and chairman of Lane Crawford), managing director Andrew Walton (A.W.) Brown (1900-1958, general manager of Lane Crawford who received a OBE for running the canteen at the Stanley camp and rebuilt the firm from $1000 after the War), accountant Sydney Hampden-Ross, W.A. Stewart and secretary F.W. Verel. In August 1951, the board of the company voted for liquidation despite the fact the firm was still making profits of $56000 that year. The firm was formally dissolved in 1952. “Perhaps by contrast with cities more essentially tropical, where appearance comes second to comfort, Hongkong will strike the visitor as a “dressy” place, and, if he be in need of a smart outfit, he will naturally look round for a high-class tailoring establishment. Such a one is that of Messrs. Diss Brothers in Wyndham Street. The partners are Messrs. G. A. (George Ambrose) and A. C. (Arthur Charles) Diss, who both received their training in the West End, and have since been connected with leading houses in Colombo and Singapore. They are members of a family of five brothers, all of whom, following in the footsteps of their father, are engaged in the tailoring trade. Together, they have had an Eastern experience aggregating half a century. Messrs. Diss Brothers opened business in Hongkong eight years ago, and, by reason of their skill and experience, they have gained an enviable reputation for good and careful workmanship. They are the only exclusively tailoring firm”. According to the HK Jurors List, A.C. lived in 6 Babington Path while G.A. resided in 7 Robinson Road. In a period of 10 years between 1908 and 1918, the Diss Brothers was burglarized four times. In 1908, the store was robbed. In 1912, it was robbed again with $1200 worth of materials stolen. In December 1918 in broad daylight, a burglar sneaked into the store taking $200 worth of materials and also Mr. Diss’s coat. Only a month later in January 1919, the shop was burglarized again and over $1000 of materials were stolen. 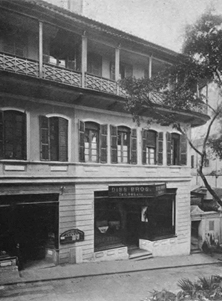 In 1923, Diss Brothers was sold to Mackintosh’s and by the 1924 Jurors List, A.C. Diss was listed as a cutter for Mackintosh’s with address listed as 18B Nathan Road in Kowloon. James T Shaw ad from the 1919 Official Guide for Shippers & Travellers to the Principal Ports of the World published by the Japanese shipping firm OSK. 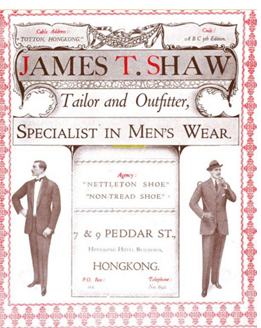 James T. Shaw was a tailor shop active from the 1910s until 1940s. The firm’s founder James Totten Shaw (1874-1922) is buried in the HK Cemetery. His name first appeared in the 1900s as a cutter for Cottam & Co, a tailor shop out of Pedder Street that was owned by J.P. Cottam. In the 1910 juror list, he was listed as a tailor and his address was listed as 71 The Peak. 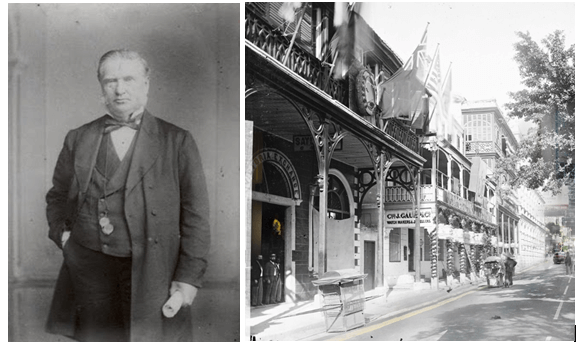 In 1912, the firm was operating out of the HK Hotel building and 2 Zetland Street. By 1921, his address was listed as 18 Conduit Road. After his death in 1922, the firm appeared to have continued until the Japanese occupation. 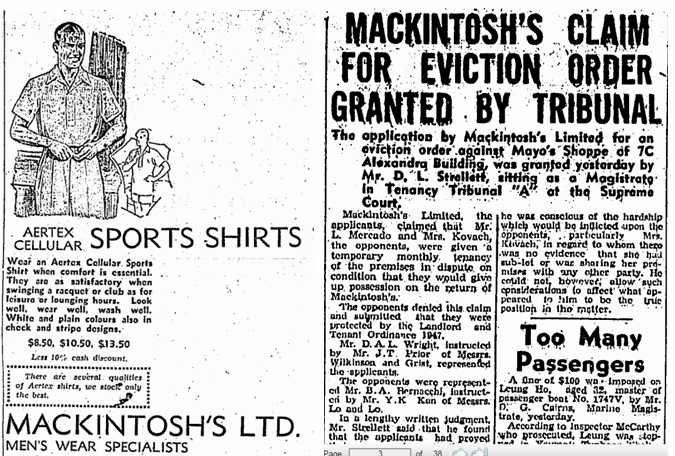 Mackintosh’s was founded in 1913 by Frederick Alexander (“F.A.”) Mackintosh, who had previously worked for Lane Crawford. The firm operated out of the Alexandra Building in Central and its tailoring department was headed by R.R. Davies, supported by many local staff. In addition to tailoring business, its outfitting department was sole agent in HK for Austin Reed, “K” shoes, Aquascutum, Henry Heath and Scott & Hillhouse in addition to being general agent for Van Heusen, Jaeger, Aertex and Morley’s. When the Japanese attacked in 1941, five of the six foreigners (except for FA who was well above military age) who worked for the firm enlisted in the Volunteer Corps and all (including F.A.) became prisoners of war when the Japanese occupied HK. One of them, J.F. Hickman died in 1943 during his internment in Stanley. After the War, business slowly resumed in 1946 as the supply of materials slowly resumed and the firm returned to its premise at the Alexandra Building where F.A. Mackintosh and R.R. Davies were back in charge. The firm was the top retailer of men’s wear and had the reputation for being expensive and continued to operate out of the Alexandra Building until at least the 1970s. According to Papineau’s Guide to Hong Kong, and Spotlight on Macau in 1970, Mackintosh’s also tailored extensively for British Amy and Navy officers. In 1960, its chairman was James T. Prior, a partner of the law firm of Wilkinson & Grist, chairman of China Oxygen & Acetylene and president of YMCA. (HK Who’s Who) According to the HK $ Directory, the chair and managing director of the firm in 1977 was Mrs. P.M.G. Boardman (who co-owned a number of horses with Denis Hazell, owner of an import/export firm of the same name which Boardman was also a director of) and its directors included Dr. P.C. Woo CBE, Dr. S.G. Davis OBE and R. Boardman who was also manager of the firm. The company is still live but the tailoring business is no longer active. Indian tailors have long been a force in the HK tailor industry, tracing back to the 19th century. From the 1897 The Directory & Chronicle for China, Japan, Corea, Indo-China, Straits Settlements, Malay States, Sian, Netherlands India, Borneo, the Philippines, there were 3 Indian tailors in HK: A. Abdoola & Co at 132 Wellington Street, Hoosenally, Fazulally (which appears to be the continuation of Shakailly Fazulally) operating out of 6-8 Peel Street and Hussunally & Co on 128 Wellington Street. After the War, most of the Indian tailors are Sindhis from the province of Sind (now part of west Pakistan), and they played crucial roles in putting HK on the map for custom made suits. Firms like Tajmahal’s, Harilela’s and Mohan’s invented the mail order suit industry in the 1950s and augmented their fortunes by diversifying into other businesses such as properties and hotels. In 1970, 70 tailors (almost all Sindhi) led by the Mohans and the Harilelas established the Mail Order Association of Hong Kong as a self-policing trade group to promote the industry and handle any customer complaints. Today, the Indians remain a powerful force in the industry with firms like Sam’s Tailor and Raja Fashion being the first names that comes to mind internationally when people think of Hong Kong tailors. Tajmahal’s (originally known as Taj Mahal Silk Store) was founded in 1925 by Shamdas Narain, who arrived in HK with no knowledge of Cantonese or English. He had done business in Indonesia, China and Japan before settling down in HK as one of the 100 or so Indian peddlers of general merchandise. Thanks to his street smart, Narain was able to set up his own shop in the King’s Theatre building in Central and became one of the first Sindhis to own a car in HK. 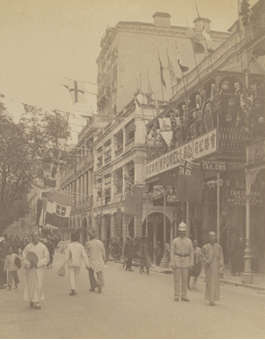 During the Japanese occupation, the Narains served as messengers for HK’s Indian community as one of the brothers owned a store in neutral Macau and could send letters overseas. After the War, Narain’s son Lachman joined the family business and oversaw its major expansion. Born in HK in 1932, Lachman Narain was educated at St Joseph’s College and married Maina Sippy in Bombay in 1953, with whom he has 3 sons (Suresh, Vinod and Ravi) and 1 daughter (Indra). By the late 1960s and early 1970s, Tajmahal’s had six locations and its main store was located at Rediffusion House on Gloucester Road in Wanchai. One of its famous clients was the entertainer Sammy Davis Jr who not only ordered 50 suits from the firm but joined up with the firm to manufacture and export suits under the Sammy Davis Jr Fashions Ltd label in 1971 (dissolved in 1999). In 1969, Lachman formed Tajmahal’s Holdings with HK$10 million in paid up capital to diversify into real estate and restaurants. The new firm was hailed as one of the largest Indian-owned private limited companies in HK at the time. In 1970, Tajmahal’s Ltd went public on the HK Stock Exchange, issuing 650,000 shares at the price of $7.50 per share. To enhance the prestige of the group, Narain managed to secure Dhun Ruttonjee (1903-1974), the leading Indian businessman and politician in HK at the time, as chairman of the listed entity. In 1972, Tajmahal’s raised an additional $20 mil in capital and expanded its number of retail stores to 13. 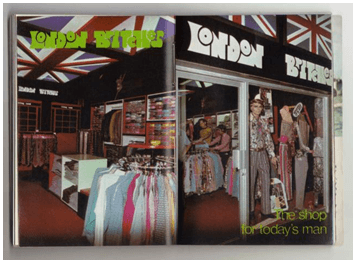 Aside from Tajmahal’s, the group also operated London Britches, The Custom Shop, restaurant Fernando’s Hideaway and invested in the supermarket chain Park N’ Shop which was founded in 1972 by Y.K. Lau. The firm was also involved in property development such as a residential project in Repulse Bay and was renamed Consolidated Properties and Stores (CPS) in 1972 to reflect its two lines of business. In 1978, Swire Properties acquired CPS, backed by a HK$93 million loan from HSBC. The same year, Lachman formed Lacnar Investment Ltd and built up an extensive portfolio of equities and properties across the globe over time. He was active in the Indian business community, having served as chairman of the Indian Chamber of Commerce and committee member of Community Chest. During the 1980s, Lachman actively lobbied the UK Parliament for UK nationality for Indian residents in HK. Detaram Sakhrani Mohan (better known as “D.S. Mohan”, 1912-2000) arrived in HK from India in 1931 to join a relative. He chose to work as a salesman for a non-relative Sindhi in the garment business and then started Mohan’s in 1939 with his new bride from India. During the Japanese occupation, Mohan was one of the 500 Sindhis stranded in HK. Business took off in the 1950s with the Korean War and the massive influx of U.S. soldiers and tourists. Mohan pioneered the mail order suit business in the mid-1950s and by 1958-60, his business was employing over 100 people with two stores – the Mohan’s in Kowloon primarily sold HK goods to tourists while Mohan’s in HK island (at King’s Theatre) sold US goods. All the orders were taken at his TST and Central stores and made by Cantonese workers in his workshop on Lock Road. With his newfound wealth, D.S. purchased a home in 11A Creasy Road in Jardine’s Lookout, making him the first Sindhi to purchase a house in HK. 1963 was a landmark year for Mohan’s. Its TST store at 14-16 Hankow Road was re-developed into the 12 story Mohan’s Building (re-developed in 2013 into Prince Tower). They also formed a knitwear factory under the name of Hongkong Wool Knit Manufacturing Ltd (dissolved in 1987), which was chaired by D.S.’s son in law Lachu B. Melwani (1934-), who also served as managing director of Mohan’s, Mohex Custom Tailors and Peacock Handsewn Clothiers. But one of the biggest moves was the opening of a store in New York, headed by his 23 years old son Gobind Mohan (better known as “Obi” or “Obe”), selling custom suits at half the price of American competitors by filling the orders in HK and importing the products into the States, usually taking 5 weeks. By 1965, the Mohan’s empire was making US$2.5 mil in profits on sales of US$12 mil and included a footwear factory, several apparel plants, a nightclub in addition to the 2 stores in HK and growing network of stores in the US (1 in NYC, 1 each planned for LA, Detroit and Chicago that year and ambitious plans to open over a hundred) employing over 500 tailors and seamstresses. 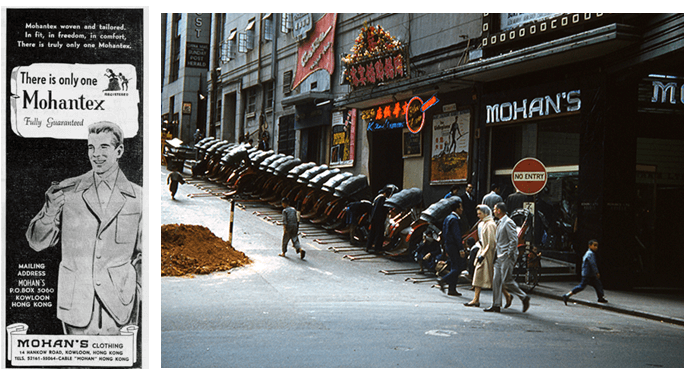 In 1968, the Mohans expanded into real estate and in 1970, Obi returned to HK from the US after 7 years. The family took Mohan’s Property & Investment Ltd public on the Far East Stock Exchange in 1973 and raised HK$12 million. The firm’s board included Macau casino kingpin Stanley Ho, SHK Securities founder Fung King-hey and prominent contractor Lee Sing-man. The family was hurt very badly by the 1973 crash and in 1978, Hutchison International under the leadership of Bill Wyllie acquired 77% of Mohan’s Property & Investment Ltd. Mohan’s Ltd itself was dissolved in 1995. In the 1990s, the family was involved in buying goods such as pens, pencils, watches, textiles and cotton from China and selling them in Africa trading firm Golden Mirror and more recently Obi is involved in green energy products. Outside of work, D.S. served as president of the Hindu Association for 15 years. In 1999, D.S.’s granddaughter Tania Mohan launched Tabla, a luxury womenswear brand inspired by India which currently has stores in London and HK. Lots has been written about the Harilelas, the most famous Indian family in HK best known for their hotels and restaurants so this entry would focus on their tailoring operations which was the foundation of the family fortune. Starting out by making uniforms for the British Army in 1945, Harilela’s became one of the largest custom tailoring establishments in Asia in the 1950s and the 1960s by catering to the US and British Army and international tourists and pioneering the mail order business. At the height of the tailoring business in the 1960s, the Harilelas had 45 tailoring outlets in HK, Bombay, London, Frankfurt, Okinawa (7 branches), Iwakuni, Saigon, Taipei and Guam. The HK operations included the head office at the Harilela Building at 32-34 Nathan Road (now Imperial Hotel), retail branches in TST (HK Hotel, Ocean Terminal, original store at 1-2 Middle Road, ground floor of the Hotel Merlin at 2 Hankow Road and 55-59 Nathan Road), Wanchai (China Fleet Club and Asia House), the Colony Club at the British Army barracks on Argyle Street in Kowloon, and a garment factory in Hunghom established in 1957 which employed over 600 tailors. Harilela companies involved in the clothing business include Harilela’s Ltd (incorporated in 1965, renamed Avisha Ltd in 1998), Imperial Clothing Ltd (incorporated in 1965, renamed Imperial Merchandise in 1975 and dissolved in 2005) and Ambassador Arts & Clothing Ltd (incorporated in 1960, dissolved in 2005). The family also operated a women’s clothing store Mohanlela’s, named in 1948 after the youngest Harilela brother Mike who was 3 at the time. Starting in the 1960s, the Harilelas began to diversify into real estate, hotels, securities and other lines of businesses and over time gradually phased out of the tailoring business. Bob Harilela, the 4th of the 6 Harilela brothers who was responsible for overseeing the retail and restaurant operations of the group, was chairman of the Mail Order Association of HK from 1973-1976. Kima was founded in 1955 by J.W. Kima and his wife Radhi. Born in Hyderabad, Sind in 1903, J.W. 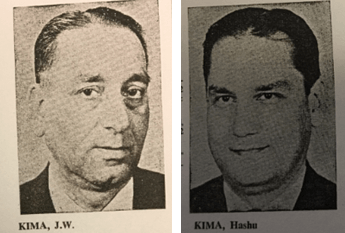 Kima was educated in Cairo before coming to HK where he worked for two Indian trading houses – Kishinchand Chellaram (1940-49) and M. Dialdas & Sons (1949-54). The firm operated out of Haiphong Mansion on 101 Nathan Road and Wing On Mansion on 26 Hankow Road and also had office and showroom at Star House. Outside of work, JW Kima was a founding member of the Indian Chamber of Commerce, treasurer of the Kowloon Rotary Club and committee member of the Kowloon Residents Association. By 1970, J.W.’s son Hashu (1928-, also known as Harry) had succeeded him as chairman of the firm. Old newspaper articles show that Harry traveled extensively to the US in the 1960s to promote his tailoring business. Harry was a co-founder of the Young Executive Group in 1963 with fellow Sindhi tailors Bob & Gary Harilela of Harilela’s and Lachu Melwani of Mohan’s and other Sindhi businessmen. Other Indian tailors from the 1950s and 60s include the Keswani family’s Moti’s/Moti Brothers (out of 31 Nathan Rd and later Hotung House) and the Budhrani family’s Modes Custom Tailors (out of Alpha Mansion and Mirador Mansion). This article was first posted on 9th October 2017.